READY TO MEET THE NEW CAST OF SWAY 2.0? I’m sure you heard the news by now on our social media channels but if you haven’t, we are adding some new professional dancers to the cast of SWAY 2.0 ! Last Friday, while shooting this episode, we got the good news delivered by Val Chmerkovksiy. 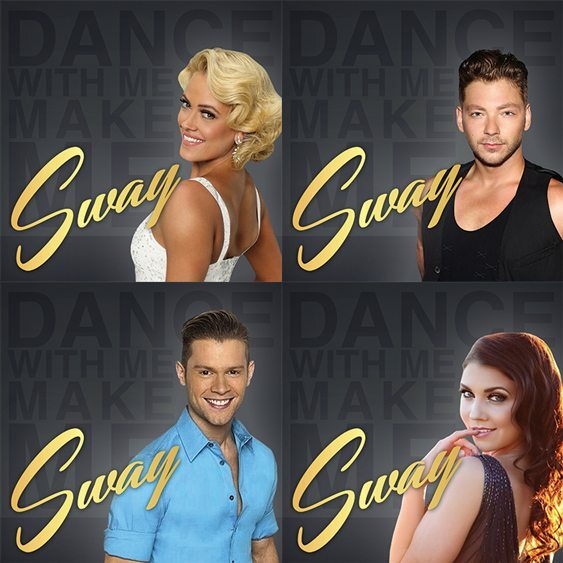 He informed us that Dancing with the Stars and So You Think You Can Dance professional dancers Peta Murgatroyd, Henry Byalikov, Jenna Johnsonand Serge Onik will be performing in SWAY 2.0! We’re thrilled to have such talented individuals as part of the cast. It’s really inspiring to share the stage with such fantastic dancers, and it’s a real treat for the audience. It’s not easy getting a cast together for this type of show. Especially of this caliber. Most of the dancers have full-time commitments elsewhere. Whether you are dancing on a national TV show, touring with various companies, a full-time instructor at one of the best dance studios, or are a world-renowned performer/entertainer of sorts, it is really hard to fit the show into your schedule on relatively short notice. Also, don’t forget that there is an ample amount of rehearsal time required to put it all together. As talented and experienced as these dancers are, performing live in front of millions of people each week, it takes time to understand the storyline and each character that they play within SWAY. David and Tiago, the choreographers, did a brilliant job of creating a story and blending each number seamlessly… and we want to maintain that continuity. Those of you who saw SWAY: A Dance Trilogy 1.0 know what I mean. Let’s also not forget some of the ridiculously talented and skilled Dance With Me dancers that we brought back for SWAY 2.0. They may not be have thousands of followers on social media, but they are world-class dancers in their own right. We wanted you to get to know some of them a bit better, so we’ll introduce them throughout the upcoming “webisodes”. This time, we meet Ilias Vinikovskyi, Dance With Me coach, and Justin Schaffner, a Dance With Me Glen Head instructor. Lastly, we wanted to get some honest feedback from some attendees who saw the first SWAY back in July. So we interrupted our students, Carmina from Dance With Me SoHo and Jane from Long Island, in the middle of their lessons and recorded what they had to say. I promise we did not bribe them haha! Maks, Tony, and Val are currently working on recruiting some more professional dancers and special guests. Either way, the core is intact, and it will undoubtedly be another great show! ARE YOU EXCITED FOR THE SHOW? WHAT ARE SOME CAST MEMBERS YOU’D LIKE TO SEE ADDED? TELL US BELOW, AND DON’T FORGET TO SHARE!